When you send an email, do you ever wish you could quickly and easily “dress it up”? Add backgrounds, borders, or images? That feature has actually been around in Apple’s built-in Mail app for quite some time, and it turns out that it’s still there even in macOS Sierra. 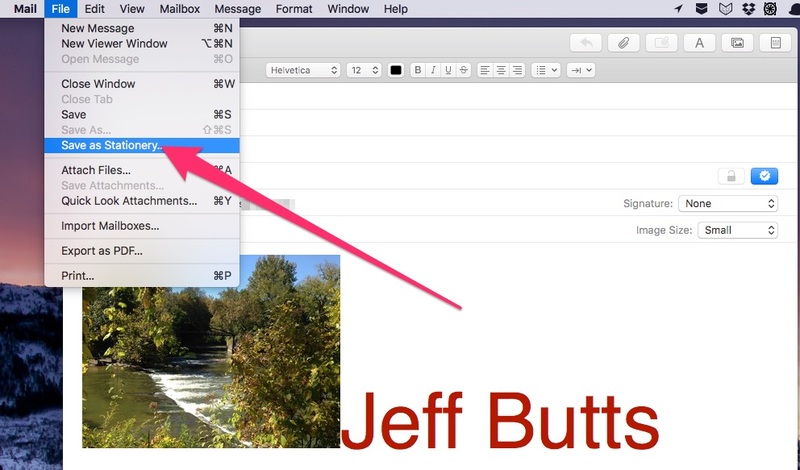 You can also use Apple Mail stationery to decorate your emails. The feature is pretty well hidden for some reason. The icon you click on to open the stationery pane doesn’t really look like anything intuitive. Nevertheless, it’s waiting for you right there in the upper right corner of your window when you’re composing a new email. 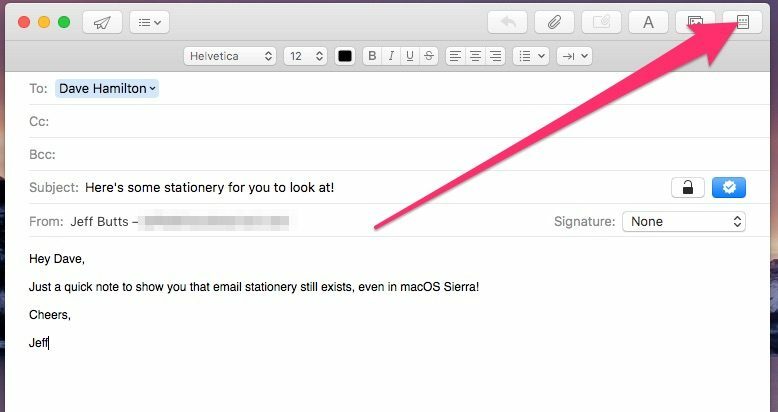 Let’s click on it and see how to use Apple Mail stationery. 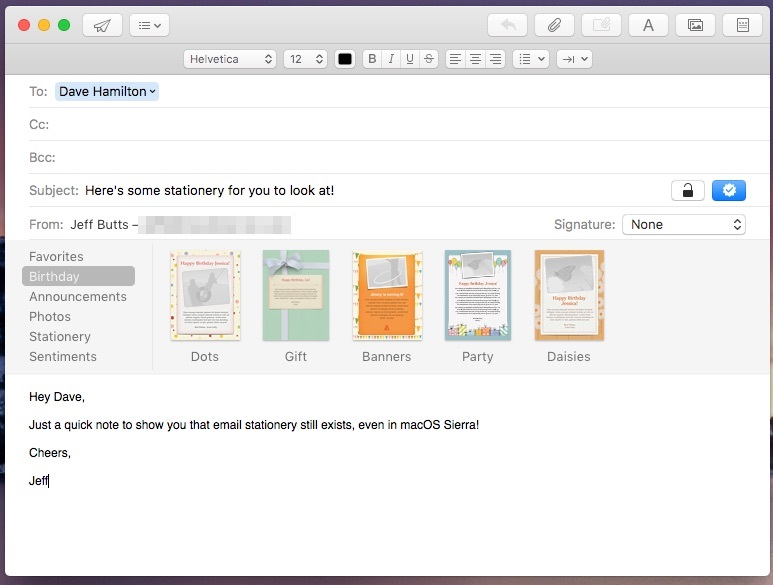 Lo and behold, there’s the Apple Mail stationery pane. It’s organized by categories like Favorites, Birthday, Announcements, Photos, and so forth. If you choose a piece of stationery that allows photos, you’ll see blank spots to place your pictures in. Just drag an image from your Finder to insert it into its frame. Unfortunately, you can’t just drag images from the Photos app. It seems odd that Apple wouldn’t provide this functionality, but I’ve seen other instances where dragging and dropping a picture from Photos did absolutely nothing. What you can do, however, is click on the image frame itself. A small window will pop up providing you access to your Photos library. 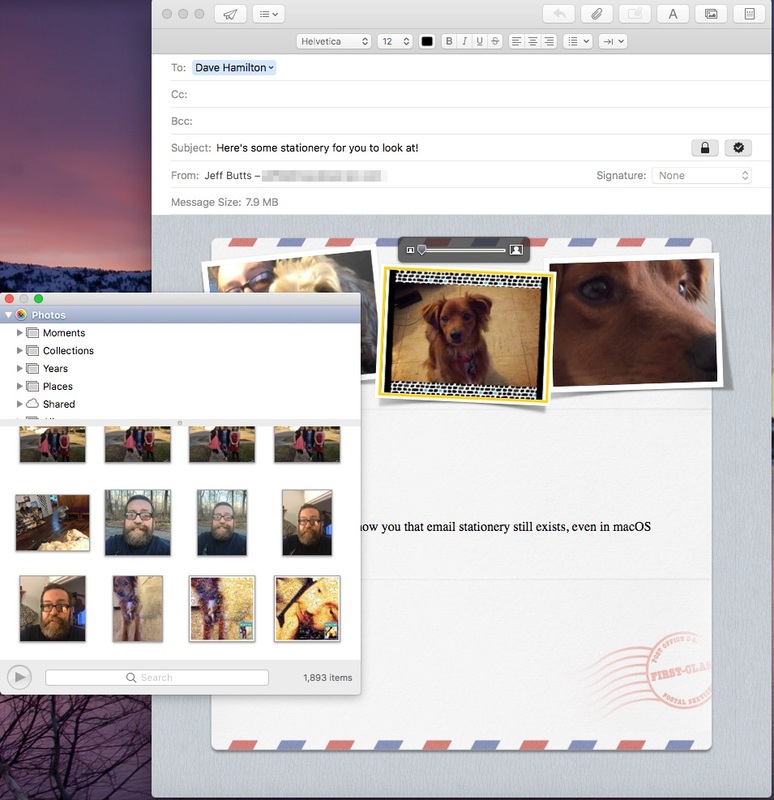 You can drag images from that window into your email. 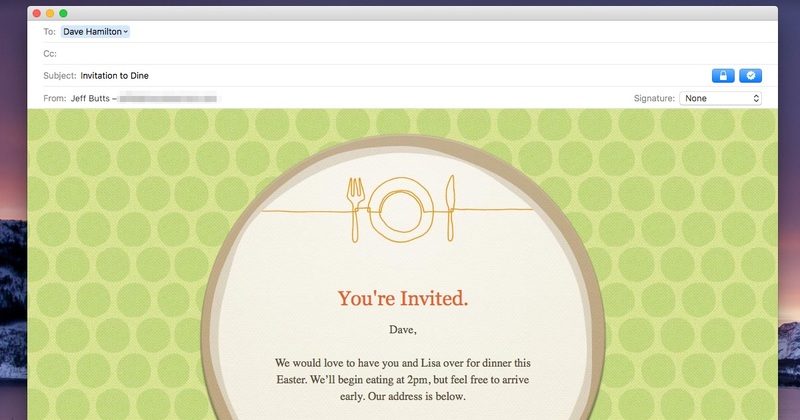 You can even create your own templates to use in your email. In a new message, decorate the email the way you’d like and then click File from the top left of the menu bar, followed by Save as Stationery. I wish you could drag images straight from Photos into the stationery. While the picture chooser is functional, it doesn’t have the same search capability as the actual Photos app for macOS has. 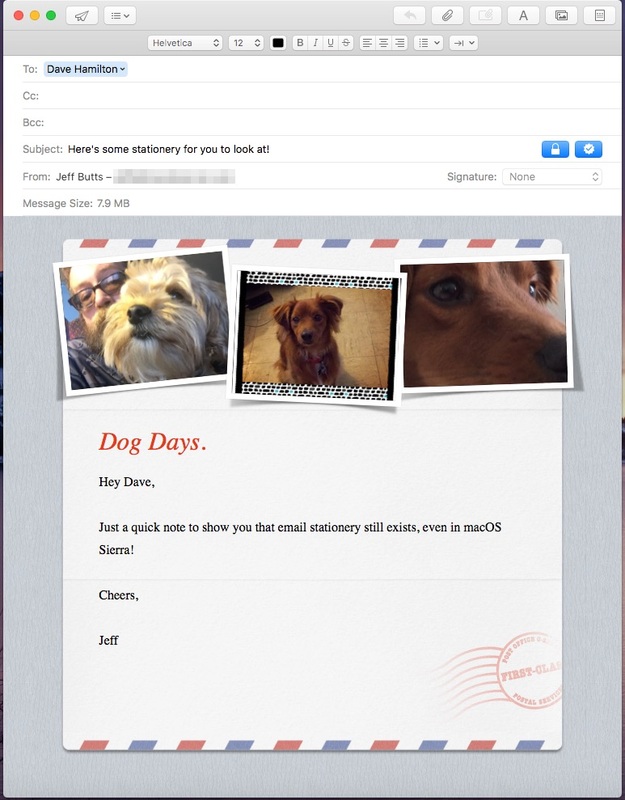 Still, the feature is better than nothing when you want to dress up your email a bit. 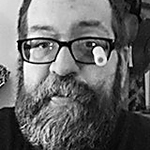 When this feature was first introduced I created some custom ones. They were on my old iMac, but I still have the files so I should look into installing them.